Who is eligible to submit Form 15G and Form 15H? Where can Form 15G/H be used? Step by Step guide to fill the form? Who can submit Form 15G and Form 15H? Form 15H is meant for senior citizens while Form 15G is meant for all other individuals and HUFs. The total interest income for the financial year is less than the minimum tax exemption limit for the year. For FY 2018-19 this limit is Rs 2.5 lakhs. The total tax calculated after taking all the deductions and exemptions is NIL for the financial year. 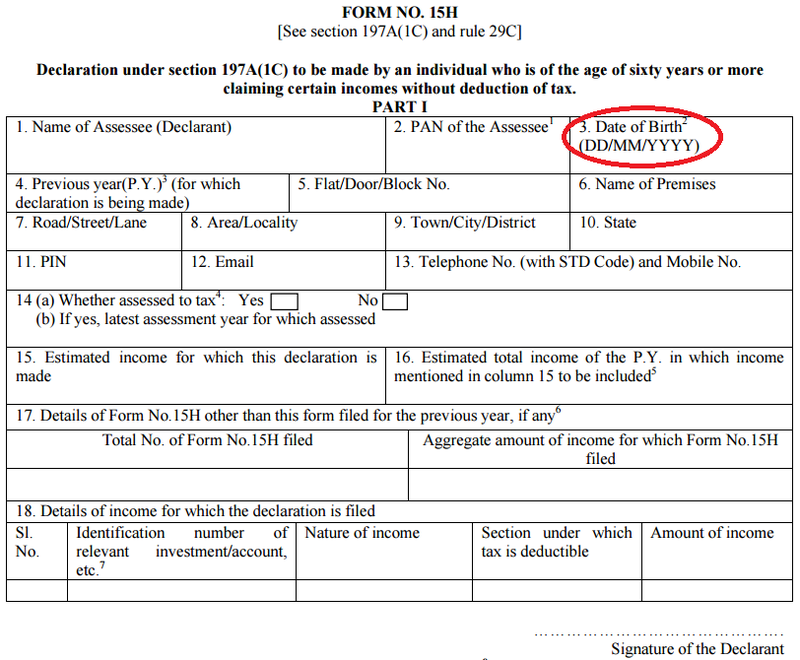 The figure below gives example when people are eligible to file Form 15G/H. The figure below gives some examples to check the eligibility to fill Form 15G and Form 15H. How to fill Form 15G? There are 19 fields to be filled in the Form. I really wonder why Government department makes forms so complicated and use such technical field names. First Download Form 15G and Form 15H. You can also refer to your banks site to download these forms. The form refers “Assessee” everywhere. Assessee refers to the name of the person on whose name the investment has been done. 4. Previous Year is same as financial year. For e.g. you are making declaration for FY 2018-19 (i.e. for April 1, 2018 to March 31, 2019), the previous year field would be FY 2018-19. 5. Residential Status – Resident Indian or NRI. Only resident Indians are eligible to fill form 15G/H. 15(a). Whether assessed to tax under the Income-tax Act, 1961. Yes or No – Mention ‘Yes‘ if you have filed income tax return in last 6 financial years. 16. Estimated income for which this declaration is made – This income is for the investment you are giving declaration. For e.g. you have FD of Rs 1 lakh at 7% interest for 1 Year, your estimated income for the financial year would be Rs 7,000. 17. Estimated total income of the P.Y. in which income mentioned in column 16 to be included – Total income expected in the financial year for which the declaration is being made. This would include the income declared in Field 16. Aggregate amount of income for which Form No. 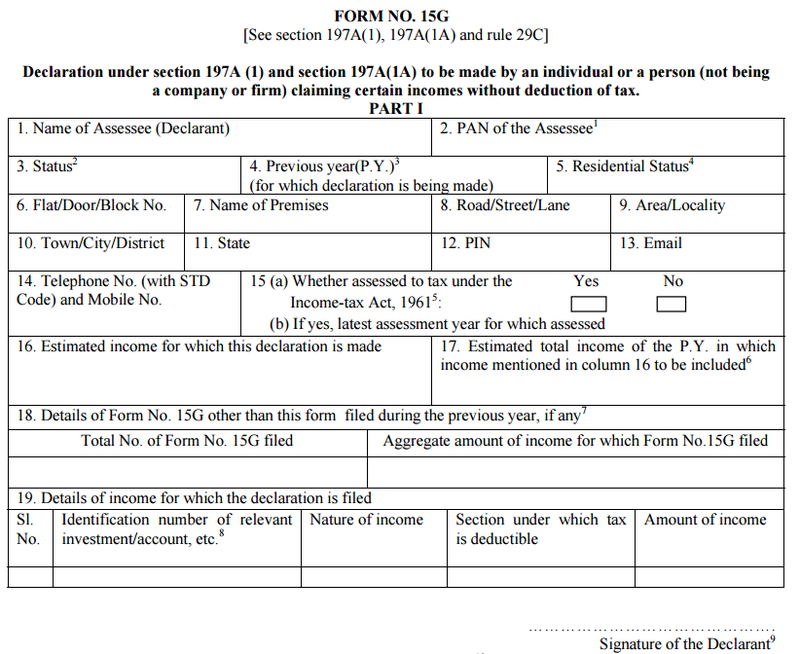 15G filed – Total income for which Form 15G has been filed. 19. Details of income for which the declaration is filed – Mention the details of the investment for which the form is being submitted. Identification number of relevant investment/account, etc. Also Read: Where to Park Money for Very Short Term? Fill the date, place and Sign on the dotted lines. This part has to be filled by the person responsible for paying the income referred to in column 16 of Part I. How to Fill Form 15H? All the fields are similar to the Form 15G except Date of Birth (Field No 3). Also Read: 7.75% Government of India Savings (Taxable) Bonds – Should you Invest? Some banks have allowed submission of Form 15G & Form 15H Online through internet banking. The screen shot below is from SBI and shows the links to be clicked for generating the form online. For all other cases, there can be rigorous imprisonment for 3 months to 3 years along with fine. You need to submit the declaration at the start of every financial year to all the banks, companies where you have fixed deposits or recurring deposits. Always attach copy of PAN card while submitting the form. In case of joint accounts, the form should be submitted by the first account holder. The forms need to be submitted in all branches where you have investments. For e.g. If you have opened FD in 3 branches of ABI, you need to submit the above from in all 3 branches separately. Form 15G/H is just to prevent the hassle of TDS and later seeking refund. You would need to file income tax return if you so mandated by law. Do not submit Form 15G/H if you are not eligible to do so. It would create more problems than solve. The Form 15G and Form 15H was revised from October 1, 2015 and has been simplified. Also the reporting to income tax department has become more robust. You must fill these forms and submit to relevant banks/institutions only if you are eligible. Do not make a false declaration as that might create problems. How to fill Salary details in ITR? Yes Deutsche Bank like all other banks in India are regulated by RBI, so you can trust the bank for your deposits. Yes your understanding is correct. I am a college student aged 20 . I have fds in 2 banks. I do not have income other than fds interest. I filled form 15g in bank 1 showing my total income( column 16) as rs 1,50,000 mistakenly. Now I am filing form 15g form in bank2. Should I mention my total income as rs 1,50,000 in bank 2 also or should i mention it as my actual interest income. You should mention your actual income. Anyway these incomes are just estimated and can change with time. So no need to worry – Just make sure you fill whatever is true to your knowledge as of today. So should I fill only my interest income as my total income? If I do so then total estimated income will be different in both forms with a huge difference. Is it necessary to mention that I have already filled a 15g form in another bank? The difference in income really does not matter. So go ahead with the right income in the new form. What need to filled in part II form..?? You need not fill Part 2 as it would be filled by person who you submit the form. Your company is deducting Rs 1500 tax every month, which means your income exceeds taxable income. In this you should not submit Form 15G. Also EPF withdrawal can be done without Form 15G, in which case TDS would be deducted and you can claim it back by filing tax return. Hi I am karthikeyan.I am going to resign my job and claim my PF amount and I will not have any income for the next few years and no FD account. What should i fill as Estimated Total income..? The estimated income for the year would be the amount which you would get from your PF. need to fill 15H for my mother -age 68 for PY (as mentioned in the updated bank Form) – 2016-2017. Her total income from APR15 to MAR16 is approx 3,69,000 thru FD’s in various banks including SBI. She also has good amount of FD under SCSS in SBI, therefore, I believe she is eligible of 1lac50 max. 1) Should I submit FORM15H in all the banks, considering that her income exceeds 3Lakhs or will the exemption be considered coz of SCSS. 2) Currently, if one of the FD matured in DEC2015, I have calculated her interest income for 9months(APR to DEC).Hope this is the right way to calculate. 3) What would be right way of calculating income of a renewed FD..FD that matured in JAN16 and renewed again till 2017? If you could state an example. 1. You should submit Form 15H to all the branches of all the banks where your mother has FD. If you do not banks would deduct TDS if the annual interest payable exceeds Rs 10,000. 2. The banks deduct TDS based on the interest you earn irrespective of the maturity period. For e.g if you make Rs 10 Lakh FD for 5 years @ 10% interest – the banks would assume that the interest credited for 1st year is Rs 1 lakh and TDS would be deducted on the same, even though the amount would mature after 5 years. You should ideally get interest certificate from your banks which would state clearly the amount that was earned as interest and TDS deducted. I joined the company on Oct 29,2013 and resigned on May 29, 2015. I’m jobless from my resignation. I would like to withdraw my pf amount. I need your complete guidance in filling the Form 15G. I’m confused to fill the section 4, 16, 17, 18 and 19. I want to know what the exact amount to be filled in section 16 and 17. I do not know to calculate these amounts. Also please guide me in calculating these amounts. Since you are withdrawing in April 2016 your field 4 (previous year) would be FY 2016-17. Field 16 is the approximate money in your EPF. Field 17 is field 16 income + any other income in this financial year like interest, salary, etc. Field 18 & 19 mention the details of other income where you have submitted this form 15G. Can amount deposited in Atal Pension Yojna can be withdrawn prematurely? Yes the amount in Atal Pension Yojna can be withdrawn prematurely before maturity. SYou will be refunded only your share of contributions and the interest earned on those contributions. You will not get the government’s contribution or the interest accruing on that amount. I left the organisation on Sep 2015.so what should I fill in the column 4 of form 15g?? Column 4 asks for Previous Year (which is same as financial year) for which the declaration is being made. In this case it would be 2016-17. Hi Amit. Thank you very much for those instruction. Nowhere on the web have I seen such clear and precise instruction. This is the first time I’ll be filing form 15G. 80% is clear. However I need help with just one or two difficulties. I’m filing this form 15g for 2 Fixed deposits I have with SBI. Right now I just have these 2 FD and no other income. So my Column 16 and 17 will be the same, right? they’ll both be the estimated total interest I’ve earned for FY 2015-2016 on both the FD. Also, I don’y have any UIN. I don’t know my UIN. Is it really necessary/mandatory for form 15g? Can I just leave it blank? Is UIN just for the bank officials and has nothing to do with me? In case these FDs are your only source of income, your field 16 & 17 would be same. Also Part 2 of the form has to be filled by the bank and so UIN is not required to be filled by you. What is due date for filling the same? There is no due date but the bank would deduct TDS until you submit relevant forms. This needs to be done every financial year and it’s good practice to submit it in April. Need clarity on this – Estimated total income of the P.Y. in which income mentioned in column 16 to be included – Total income expected in the financial year for which the declaration is being made. This would include the income declared in Field 16. What else should be included? Do interest on FD in all the banks need to shown in this field?? This would include all income including interest across FD/RD from different banks/companies etc. No it’s not compulsory. You can download the form and submit physically to banks. I resigned in sep 2014 and moved out of country. On contacting my company for PF withdrawl asked me to submit 15G form, so can I submit the 15G and what should I mention in estimated income columns. Also how to know the full PF amount to be withdrawn. Form 15G is not a compulsory form for withdrawal of EPF. It’s just to prevent any TDS that might be deducted. Also you might not necessarily be eligible to fill form 15G. As the form talks about estimated income, you can fill approximate figure you think is available in EPF. Hi I am Gaurav and trying to fill up form 15G for PF withdrawal. I left the organization in May15 and since then never joined any. So what should I write in Column 16 of form 15G. Is it the sum of salary drawn & interest earned on deposits or is it sum of salary, interest and amount of PF to be withdrawn. Field 16. Estimated income for which this declaration is made would include only the amount of PF to be withdrawn while Field 17 would include all income.